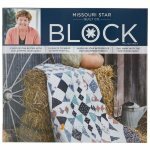 With the cooler weather of fall settling in, there’s no better time to get cozy with the latest issue of BLOCK Magazine! Check out 10 new autumnal projects perfect for every fall time activity, from a cool afternoon watching the changing leaves to a evening snuggled up by the fireplace. Plus, you’ll find full-color photos, entertaining and heartwarming stories, and absolutely zero ads in this issue, all written and produced in-house here at Missouri Star. Every project is matched with a fun fall-themed story that is sure to inspire and delight: Explore Missouri’s Amish history while you create the 54-40 or Fight quilt, or celebrate Oktoberfest the proper German way with the On the Fence quilt! Plus, there’s a bonus table runner pattern included, just in time to get the table set for Thanksgiving. Bundle up for cooler weather and enjoy the days of autumn with this issue of BLOCK Magazine. We’re thankful for you, and we hope you “fall” in love with these projects!